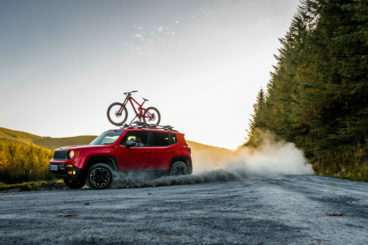 The new Jeep Renegade 4×4 sports unique, chunky looks, and, despite its fairly compact dimensions, is a tough cookie off-road. It copes well with a bit of rough and tumble but is a bit uninspired on the tarmac. It is, however, the car to look at if you want something a bit different for your family but don’t want to spend over the odds. Based on the Fiat 500X, the characterful Renegade stands out in the small crossover sector thanks to its pretty-yet-tough styling. It’s an impressive image that’s backed up by some warrior-like ability on rougher terrain, helped in no small part by a solid range of punchy engines, all of which are impressive. OSV takes a closer look at what it’s all about with our Jeep Renegade 4×4 review. The Jeep Renegade is much more accomplished off-road, where it feels excellent. However, it’s still useful on the tarmac, despite a few drawbacks. On-the-road entertainment wasn’t at the top of Jeep’s list of priorities when they put this 4×4 together, and it would have benefited from more direct steering, as well as a bit more feedback. Moreover, it doesn’t have a tight enough turning circle, which can make performing maneuvering tricks difficult. However, once you take the car off the road it really comes into its own. There is plenty of grip on offer, while the damped steering and slow action are transformed into advantages. But despite how at home it is off the road, it’s worth mentioning that it isn’t strictly an off-roader, and can still be enjoyed as you trot from A to B. The TrailHawk model is our pick of the range. Accomplished off the road, it’s powered by a 2.0-litre diesel engine that’s paired together with an excellent nine-speed automatic ‘box that allows you to plough through difficult conditions without much fuss. In 138bhp guise, it can get you from a rest to 62mph in 9.5 seconds. There is also the option of a 1.6-litre diesel engine, but it’s less smooth and not as fast. If it’s speed you’re looking for, you might want to go for the 1.4-litre 168bhp petrol engine, which is the quickest in the range. It can get you from a standstill to 62mph in 8.8 seconds, and feels just as fast as those numbers suggest. However, it does come saddled with fairly high running costs. A 1.6-litre petrol engine completes the range. It’s relatively inefficient, and takes 11.8 seconds to cover the 0-62mph dash. The exterior design of the Renegade evokes memories of the classic Wrangler, but the chunky styling promises to be polarising. While some of you will love it, others will hate it. However, one thing is for sure – this is very much a Jeep, and the brand have combined toy-like looks with a bit of ruggedness to good effect. Although this is a 4×4 very much designed to be able to cope with the demands of tricky terrain, it actually offers plenty of comfort on the road. Wind noise can become an issue out on the motorway, and this isn’t something that can be improved by opting for a more expensive trim. Inside up front, the dash boasts soft-touch plastics, but if you look around you will soon spot harder materials. 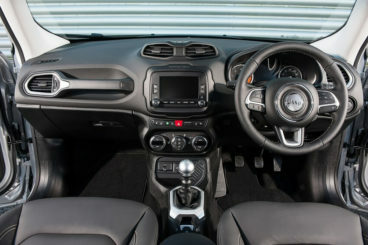 It’s a characterful interior that comes with several highlight features, including a 7-slot grille, and vent surrounds which took their cues from base-jumping equipment. It’s not the most sophisticated cabin in this class, but it’s fun and bursting with character. Basically, it’s more MINI than Nissan Qashqai. The boxy shape of the car ensures it’s fairly practical, while wide-opening doors make it easy to access the rear seats. But despite sitting up high off the ground, you don’t get to enjoy good visibility. This is because of thick window pillars, which prove to be a nuisance when it comes time to park. The Limited trim is the standout choice and comes with the likes of automatic wipers and lights and a 6.5” touchscreen as standard. 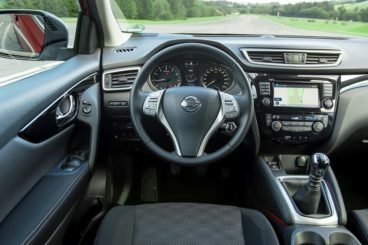 The base-level Sport trim isn’t at all basic, though, and air conditioning, alloys, and a 5” touchscreen come with the initial listing price. The range topping TrailHawk is the most combustible of the range and gets the advanced four-wheel drive, more height, and carpet mats instead of rubber flooring. 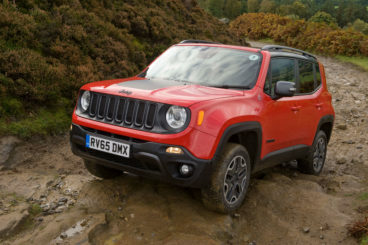 Its off road prowess also benefits from better front and rear bumpers, while it’s also the most comfortable Renegade. Prices for the new car start out from £17,500 and rise to £29,000. If you prefer to lease, you can pick up a deal from as little as £164 + VAT per month. For more information on our leasing deals, you can check out our page here. Despite its off road abilities, the Jeep Renegade 2016 is cheap to run and can compete with more conventional family cars in this sector. The 1.6-litre diesel engine is the most frugal of the range, and averages fuel economy returns of 64.2mpg while incurring a yearly road tax bill of £30. The 1.4-litre petrol naturally fares worse, but returns of 47mpg are still very good for such a powerful off roader. Road tax, meanwhile, is £130 a year, which is reasonable. The 2.0-litre diesel engines are better at hauling this tough machine more than any of the other engines. The least powerful of the two is good for returns of 55.4mpg, while the more powerful of the two averages 47.9mpg while costing £185 a year in road tax. The most basic model will appeal to families operating on a budget as it sits in insurance group 8. The most expensive four-wheel-drive model to insure occupies group 15. Most 4x4s are sophisticated and restrained with their styling. This is no bad thing, of course, but if you want a car that isn’t afraid of being a bit different, the Jeep might be for you. The bodywork is eccentric, the shape is dumpy, and the cabin is more fun than slick. The muscular Jeep certainly stands out against its cuter rivals in this sector. Few can match the Jeep Renegade when it comes to off-road ability. It’s got fearless brawn that allows it to tackle even the most fearsome terrain. This is by far one of the noisiest cars in this class. Refinement is poor right across the range, with our otherwise top pick the TrailHawk model being the main offender. This rugged hatch is probably overly focused on rougher terrain, and there are better cars in this class on the road. Let’s see how the car fares against its rivals in the comparison section of our Jeep Renegade 4×4 review. 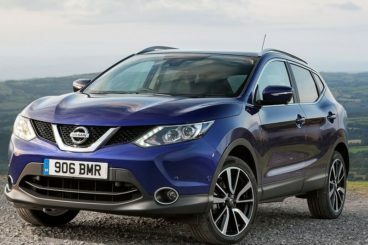 The Nissan Qashqai 4×4 is now into its second generation, and will once again be one of the most popular family cars available. 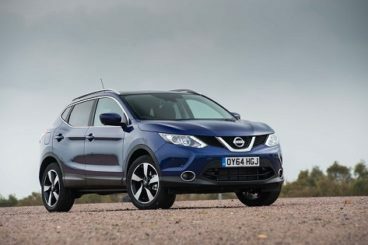 The Qashqai is more entertaining to drive on winding country roads than the Jeep, largely thanks to a suspension setup that is able to resist body lean well. It also comes with Active Ride Control that helps to shore up the brakes, ensuring that you don’t feel any of that up-and-down motion which comes when we drive over bumps. Our pick of the engines is a 1.5-litre diesel that, while not what you could call quick, has enough power to make this 4×4 a decent motorway cruiser. Moreover, getting you from rest to 62mph in 12.4 seconds isn’t exactly terrible for car such as this. The 1.6-litre diesel is the best rival to anything the rugged Jeep can offer as it’s the only power plant in the range that comes with four-wheel-drive. The petrol engines are more at home in the city, with the 1.6-litre DIG-T unit the standout choice. It has a 0-62mph time of 9.1 seconds and maxes out at 124mph. It’s much more quiet and refined than the Jeep, though if you get stuck in the wrong gear, it can feel sluggish. Running costs are very good, and it can easily rival more accomplished family car such as the Ford Focus when it comes to fuel economy. The 1.5-litre diesel engine is the cheapest to run and is capable of returning 74.3mpg while costing nothing to tax. The more powerful 1.6-litre diesel is goo for 64.2mpg and will cost £30 a year in road tax, while the 1.6-litre DIG-T petrol averages returns of 48.7mpg, and incurs an annual road tax bill of £130. Both the Jeep and the Nissan stand out in this class, thanks to their unusual styling that is trendy but sure to split opinion. The Qashqai’s interior is much more refined than the Jeep Renegades, and everything feels well built. Soft touch plastics abound, the buttons are easy to locate and find, while it’s easy to get comfortable, thanks to a height-adjustable steering wheel and driver’s seat. This is also a really useful car and has pretty much the same dimensions as the Ford Focus. As such, interior space is good, and everyone barring really tall people should have no trouble at all getting comfortable. Visibility is better than it is in the Renegade, with our only criticism being an optional panoramic glass roof that will diminish headroom for anyone in the rear. The boot, meanwhile, measures 430-litres. 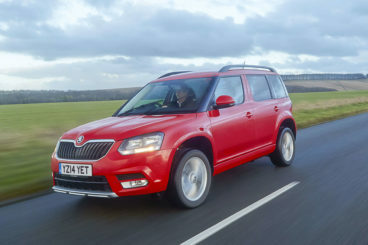 The new Skoda Yeti 4×4 is one of the best family cars around. It’s cheap to run, fun to drive, and is super practical. The Skoda is very much a family car that puts the usual family car stuff at the top of its priorities, such as usefulness. But it’s also good fun to drive. The steering is accurate, the gearbox smooth, while the controls are easy to use and well-placed. And, like the Jeep, the Yeti 4×4 likes a bit of rough and tumble. The basic 1.2-litre 108bhp TSI petrol engine might be small on paper, but it’s got a big heart and is one of the top sellers for this car. It’s got plenty of shove, but it can get a bit noisy if you push it hard. However, it’s not got enough power to haul the Yeti on a full load without wheezing and panting. If you’re going to be filling this car up with people and luggage regularly, it makes a lot more sense to instead take a look at the 2.0-litre diesel engine that comes in two power guises. Both are impressive and are only really separated in terms of how much they cost. The 1.2-litre TSI petrol unit is popular with buyers, and it’s not too expensive to run. It can achieve average fuel economy returns of 51.4mpg and costs £110 a year to tax. The 2.0-litre diesel, meanwhile, costs just £30 a year in road tax. Inside, the build quality is excellent, and the seats are comfortable. The materials should be able to cope with the demands of everyday family life, but the ride can get a bit firm at times. The dash is functional and easy to live with, and the driver’s seat and steering wheel offer plenty of adjustment. The Yetis majors on practicality, and scores points for its 416-litre boot, vast amounts of head and legroom upfront and in the back, and intelligent seating system which is known as Varioflex. The wide windows ensure good visibility while allowing lots of light into the cabin, and handy storage areas include hanging hooks and a good-sized glovebox. The new Renegade won’t sell as well as a conventional-looking 4×4, and it’s very much a left field choice. However, if you can live with its rumbustious looks, here is a car that is a genuine off-roader. On the road, it’s less astute. But when you consider the extra space, excellent visibility and bundles of versatility on offer, the useful and dependable Jeep Renegade 4×4 is not only an interesting choice – it’s also a worthy one.